We want you to be the most productive and profitable blogger that you can be. On this page, you will find resources for bloggers and content marketers that get the InspireFirst stamp of approval. We’ve used and/or deeply studied all of the recommended resources listed below and we believe that you will get great value from them. Please let us know your opinion on these resources or give us suggestions based on your experience. Disclosure: This page contains affiliate links. If you purchase a product or service that’s linked below, we might receive a commission. We take our time to carefully study the products and services that we review and recommend. We want you to only purchase the best of the best. Learn more. We use SiteGround as web hosting provider for some of our sister websites and we couldn’t be happier. They offer the perfect combination of customer service, website speed, features and price. Sign up today and get hosting from $3.95 per month. 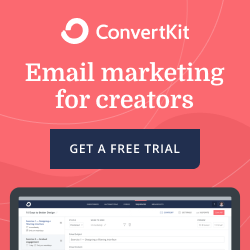 We trust ConvertKit as our email marketing platform and we highly recommend that you use them too. We love ConvertKit’s ease-of-use, segmenting features, email form creator, pricing and more! Try it for free today and get to growing and serving your email list.